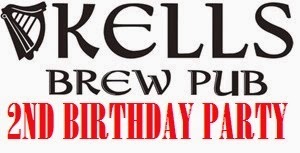 This Friday, August 15th Kells Brewpub will be celebrating its second year by inviting everyone to thier birthday party. There will be two special tappings at 6pm and live music starting at 9pm. Should be quite the showing the two special release beers are listed below. Billy Ray Citrus CDSL: Billy Ray Citrus merges the dark roasty richness of a stout with the smooth, easy taste of a session lager. Two-row, caramel, carafa II (dehusked black malt) and Vienna malts are balanced by Northern Brewer, Hallertauer, Mt. Hood and Saaz hops, a great blend of the traditional European noble hops with the freshness of the Northwest. Fermented with lager yeast at room temperature gives this beer its fruity esters and a mild green-apple aroma.